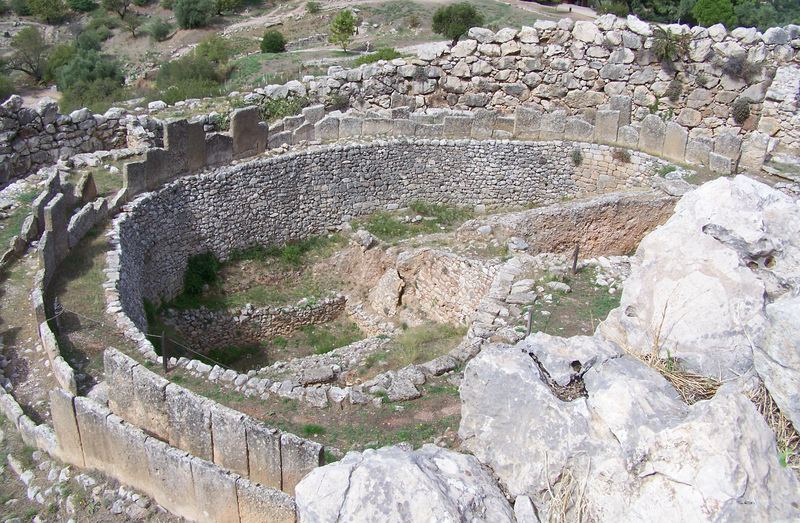 Mycenae was built between two hills, Profitis Ilias and Sara, on a low plateau dominating the Argolid plain and controlling both the land and sea routes. 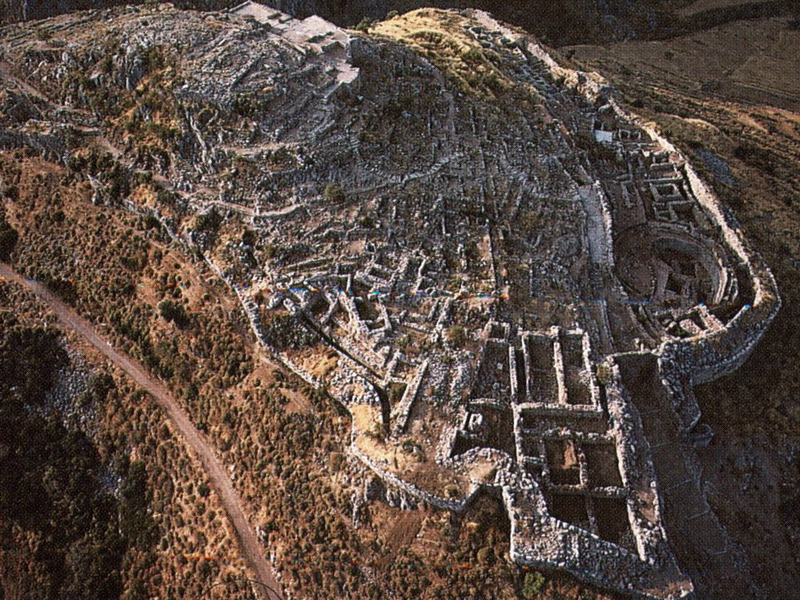 The site was first occupied in the Neolithic period of the 7th century BC. 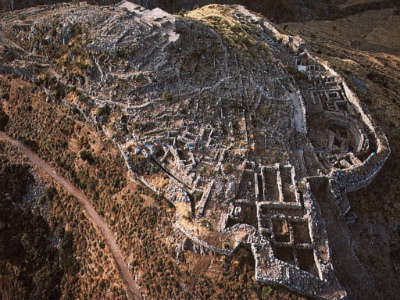 The fortified citadel was the centre of power in the Late Bronze age 1600-1100 BC and the excavated ruins that sculpt the top of the hill protected the royal families inside the famous Cyclopean walls. Mycenae gave its name to a whole civilization and according to Greek mythology it was founded by the legendary hero Perseus - son of Zeus and Danae, daughter of the king of Argos and the home of Agammemnon and Menelaus. 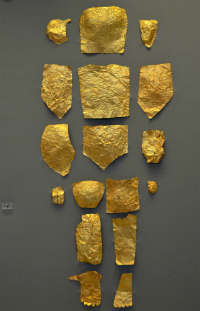 The Perseus dynasty ruled the area from Mycenae for at least three generations. Eurystheus, the last of the line, was the one who commissioned Herakles (Hercules) to perform his twelve labors. When he was killed fighting the Athenians, Atreus, the son of Pelops became the king of Mycenae and started the Atreid dynasty. Atreus' son, Agamemnon led the expedition against Troy - the story immortalized in the Homeric Illiad - but was murdered by his wife Clytemnestra upon his return to Mycenae. The Cyclopean walls were built out of huge stones and boulders and were up to 14m wide in some places and it is said in classical history that they were built by the Cyclops (one eyed giants). 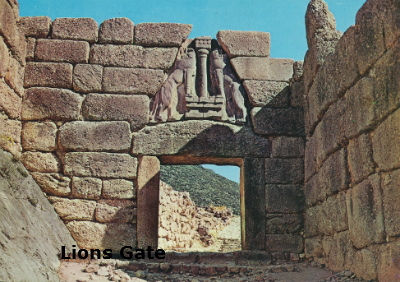 The Lion Gate is one of the most striking sights in Mycenae and provides the main access to the citadel. This emblem of two lions above the main gate was built in the 13th century BC when the walls were aligned to enclose Grave circle A. 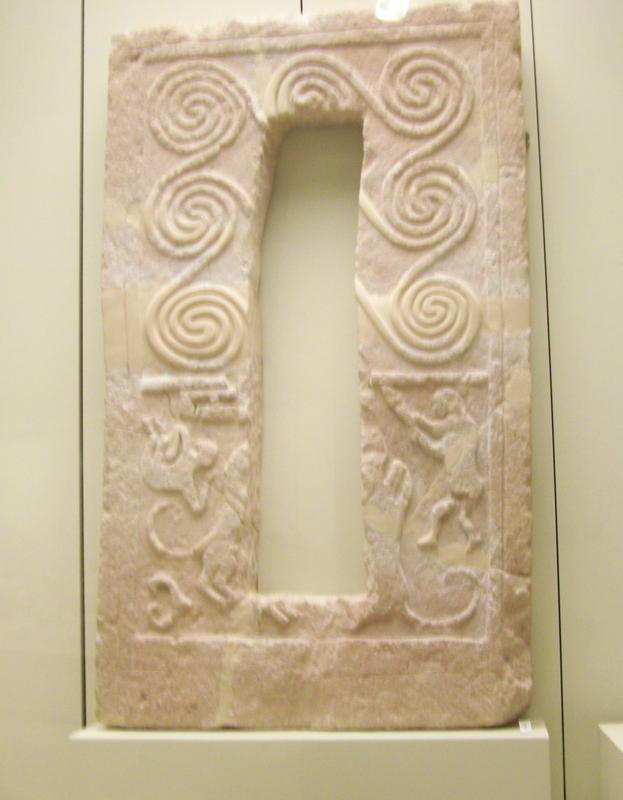 The two lions are probably the first emblem in Europe. While its significance has been lost in history, its placement above the main gate of the most powerful citadel of late Bronze Age has led to speculation that it symbolized something important like a family crest or a coat of arms. The gate was closed by a double, heavy wooden door which was secured by a sliding bar. 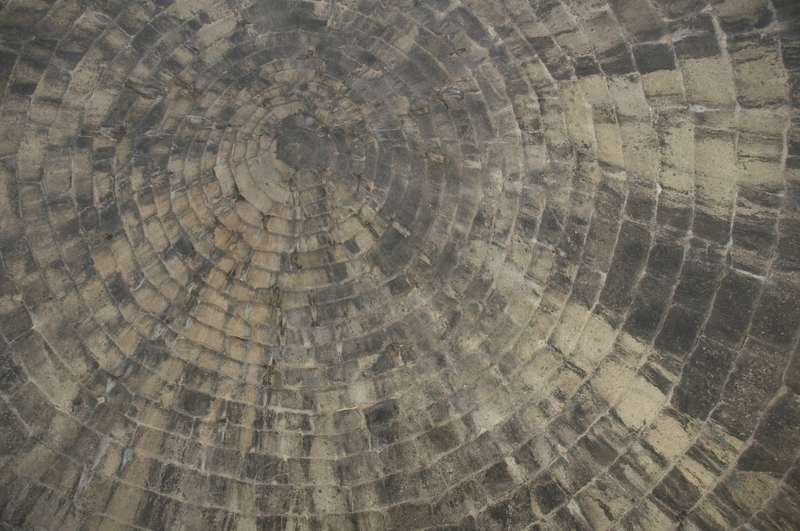 Grave Circle A has a diameter of 27m and it is located immediately to the right of the path inside the Lion Gate. The circular burial area is enclosed by a double ring of upright stone slabs which were probably filled with rubble and capped with more rectangular slabs to give a solid wall appearance. 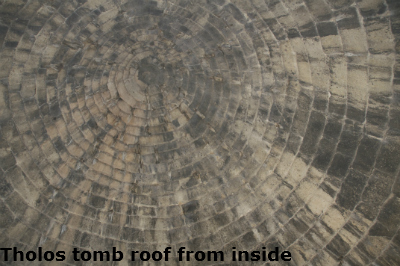 An opening in the slabs provided access to the burial site. Ten rectangular funerary stele marked the six shaft graves in which 19 skeletons were found and about 4 kg of funeral goods including the "Mask of Agamemnon". 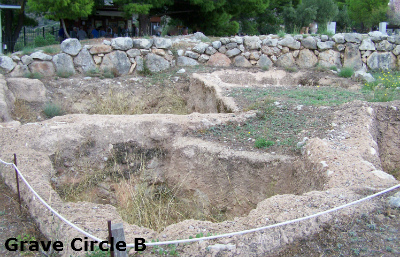 To the left of Grave Circle A are square foundations belong to the complex where the Warrior Crater was found. 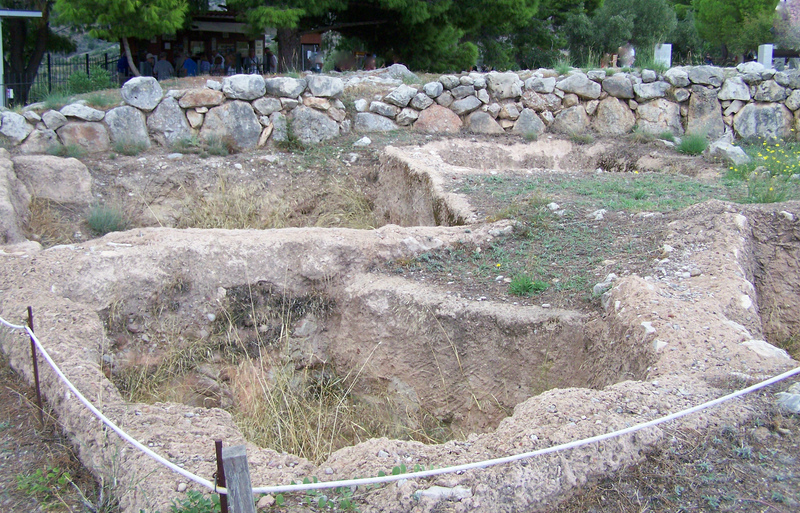 The remains of the houses are where the Linear B tablets were found and deciphered in 1953 when Michael Ventris and John Chadwick provided insight into the early history of the Greek language. 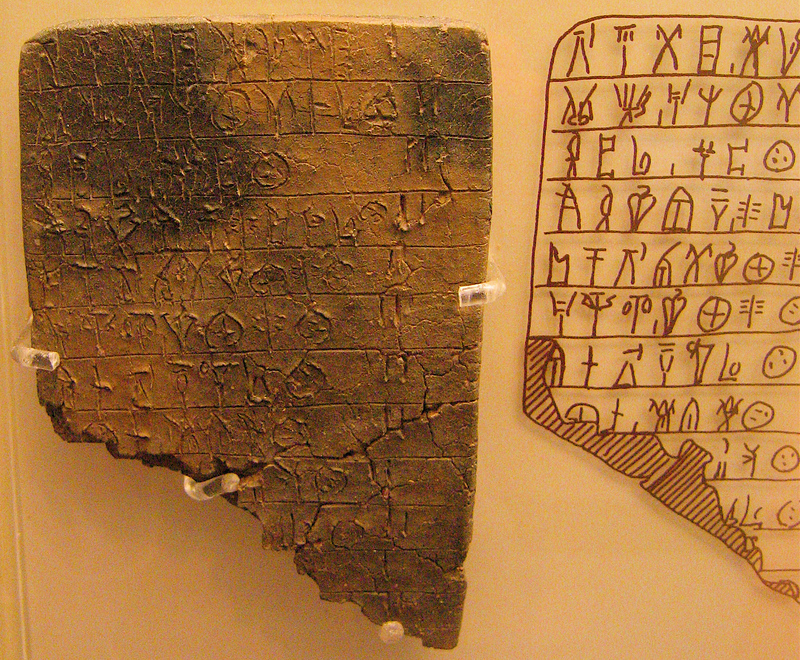 Linear B has proved to be the oldest surviving record of the Greek dialect known as Mycenaean. 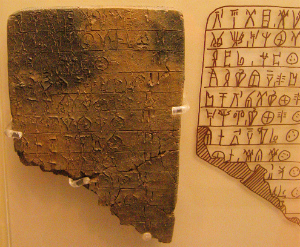 The clay tablets discovered in the house of the Oil-Merchant, have inscriptions relating to the names of workers and oil and perfumes, indicating that this was probably a workshop specializing in the production of perfumes and perfumed oils that the Mycenaeans exported. 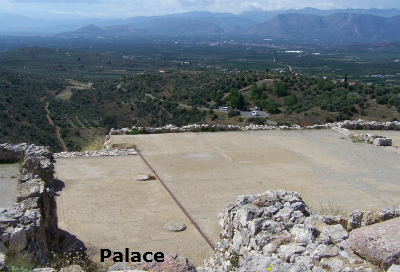 The Royal Palace is on the summit of Mycenae and was the home of the Royal families but all that remains now are the floors. The state rooms were arranged around a central court which led to the Megaron with its four columns arranged in a square around the sacred hearth. In Mycenaean times the palace would have been decorated with frescoes and mosaics. The palace was destroyed by fire in about 1200BC. 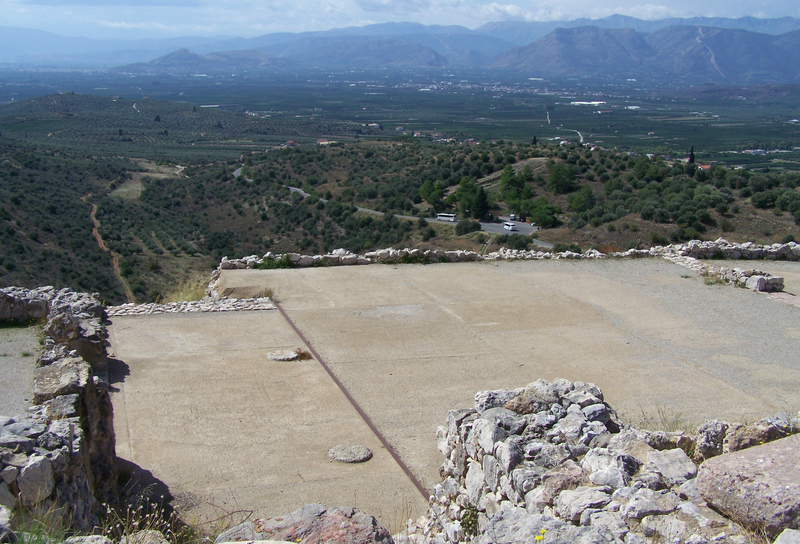 The site was occupied until 498 BC, when it was conquered by Argos. The top of the hill was levelled at this time for the construction of an Archaic temple. 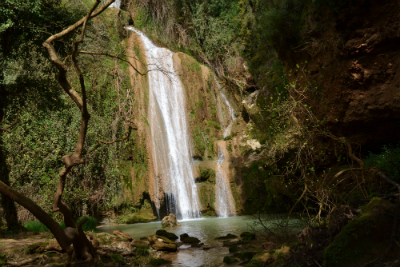 The site was re-occupied briefly in the Hellenistic period, when another temple was built. The Northern Postern Gate was constructed during the second building phase around 1250 BC the second wall opening of the Northeast Extension - the one next to the underground cistern entrance. Tholos Tombs are unique to the Mycenaean civilization, unlike the Greeks of Classical times who cremated their dead, the Mycenaean buried their dead. 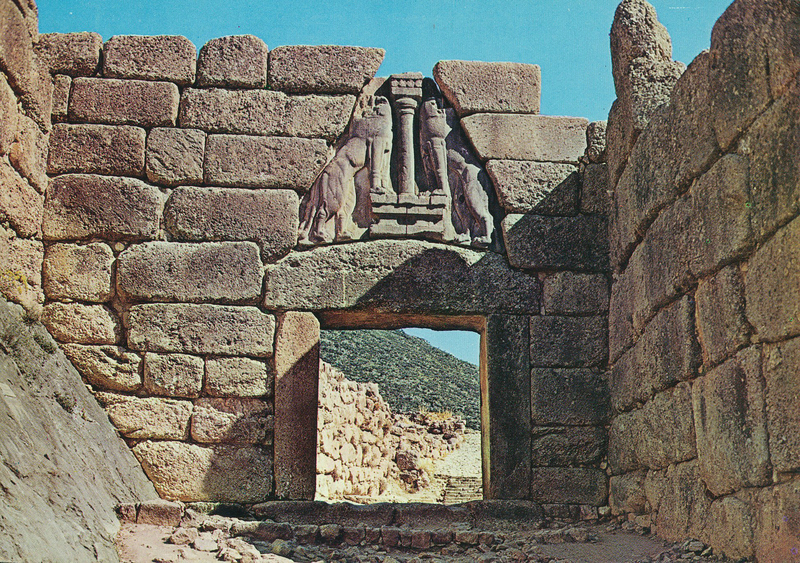 Tholos Tombs were huge bee-hive like tombs built into the landscape using successive circles of masonry closed by just two single stones and covered with earth with an open air corridor (Dromos) leading to the entrance of the tomb. So far ten of these Tombs have been discovered just outside the walls. The Tomb of Clytemnestra is just west of the Lion Gate. The tomb was looted by Veli Pasha during Ottoman rule, but otherwise is in excellent shape and shows exceptional masonry craftsmanship. 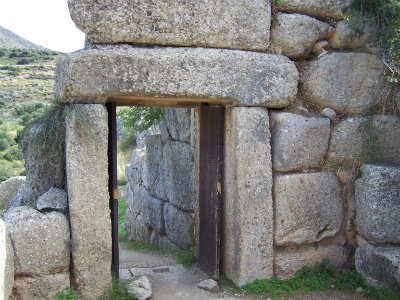 The Treasury of Atreus is at the southern end of the site on the road in. 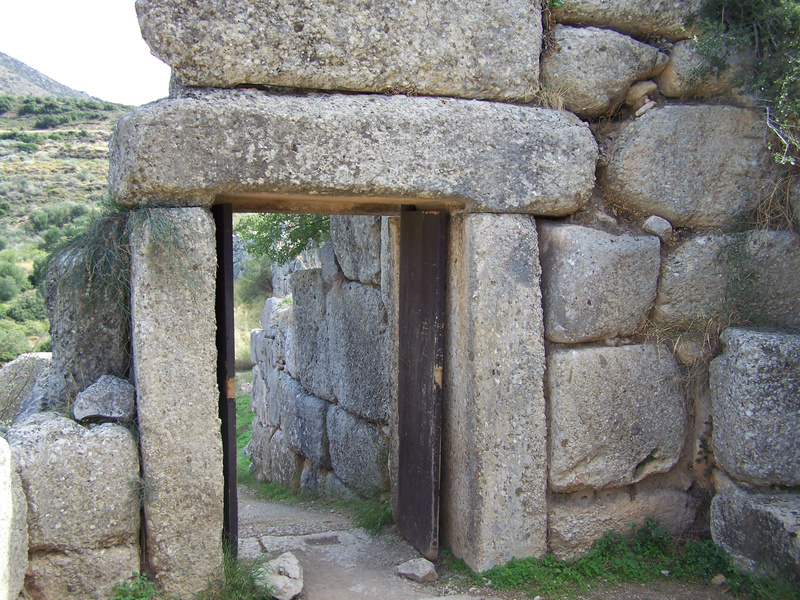 It is the best preserved tomb at Mycenae and was built in the 14th century BC. It is one of only two tombs in Greece to have a double chamber, a small room next to the main one to keep the remains of previous burials. 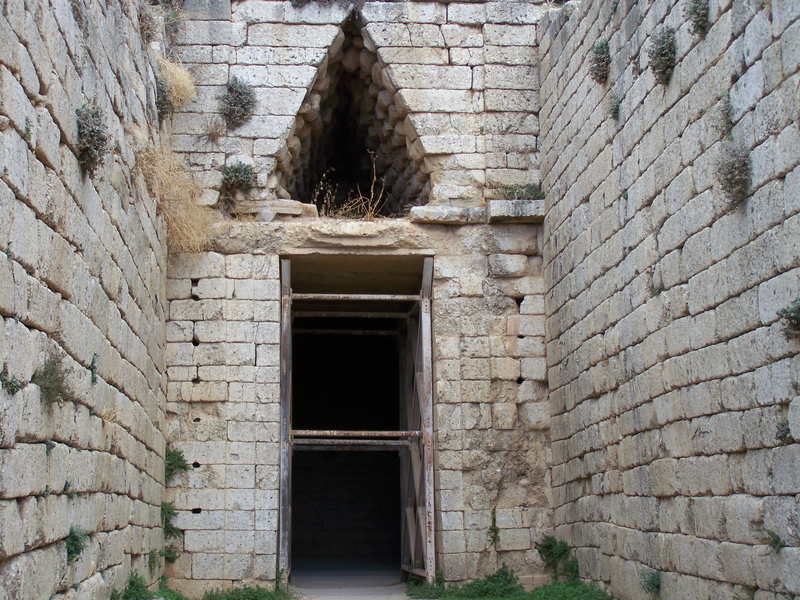 The huge tholos where the body of the king was put also contained weapons food and drink to help the deceased on his journey to the afterlife. The Treasury of Atreus had a 36m dromos leading to the tomb, at the entrance of the tomb is a 9m long lintel stone weighing 120 tonnes, it is still a mystery today how this huge stone was hoisted into position 3400 years ago. 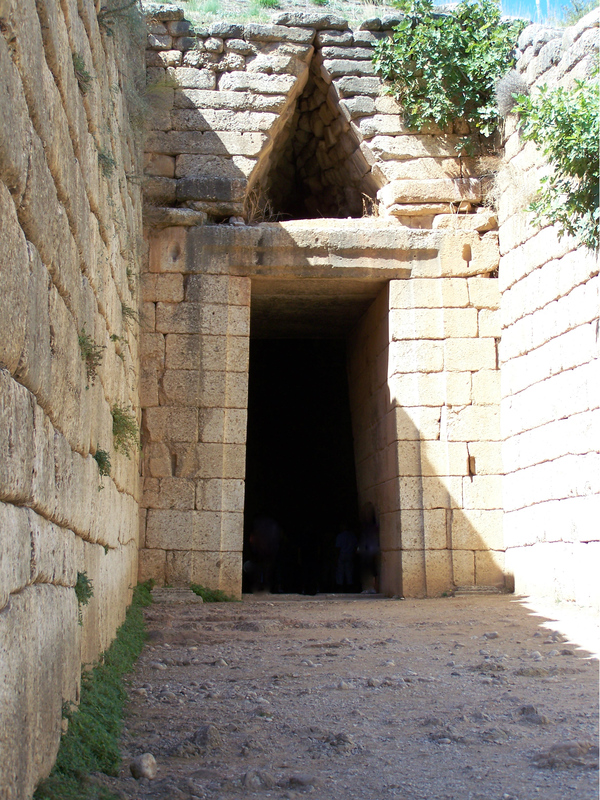 The Treasury of Atreus is also known as The Tomb of Agammemnon. 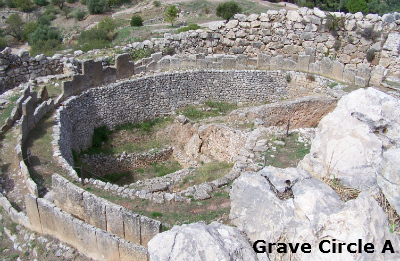 Grave Circle B is located outside the walls of Mycenae and predate Grave Circle A by three centuries (burials estimated at about 1650 BC). The large circular wall contained 25 graves, and the funerary artifacts found in excavations were precious objects of gold, ivory, rock crystal. Golden Death mask from 16th century BC, named "Mask of Agamemnon" by Heinrich Schliemann, in 1874, the German amateur archaeologist who had also discovered the ruins of Troy. 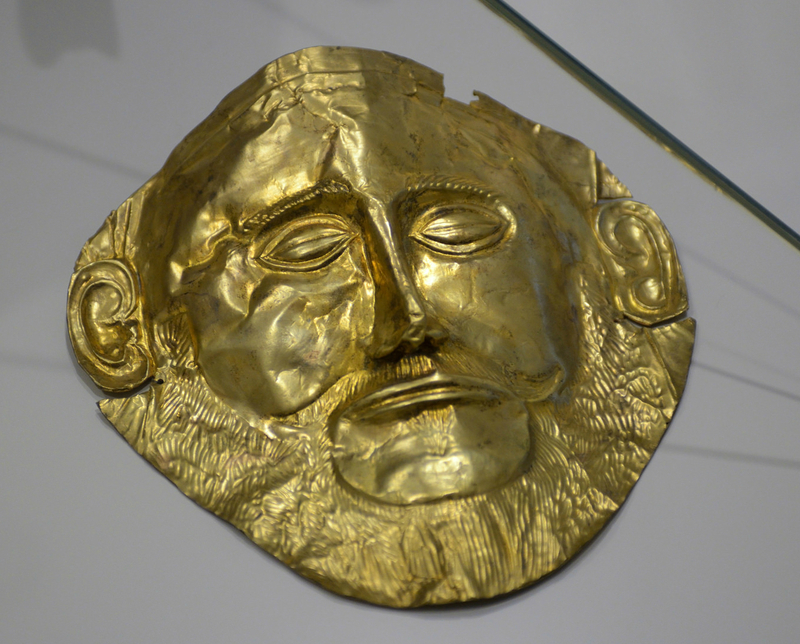 It is now believed that this claim is false since the mask predates the death of Agamemnon. 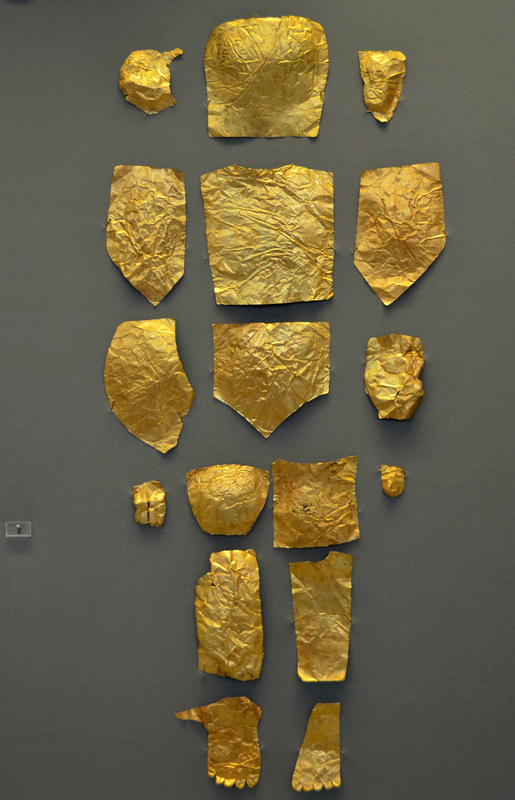 The mask was found in Tomb V, Grave Circle A .
Artefacts from Mycenae include five magnificent beaten gold burial masks. 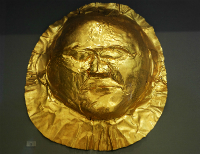 Gold Death mask 16th century BC. Found in tomb IV in Grave circle A. Gold Funeral Diadem found in tomb III, Royal Grave Circle A. 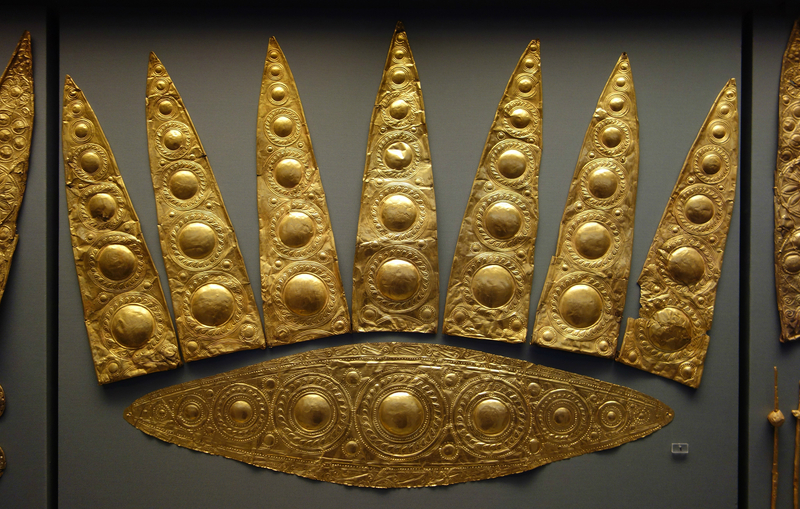 It adorned the head of the buried Mycenean Princess. Gold diadems, carved rings, cups and a lion head rhyton have also been found. Gold covering for the body of an infant, Grave Circle A. A magnificent bronze and gold rhyton in the form of a bull's head, large bronze swords and daggers with richly inlaid scenes on their blades, ivory sculpture and fragments of fresco also give testimony to the quality of craftsmanship and wealth of golden Mycenae. 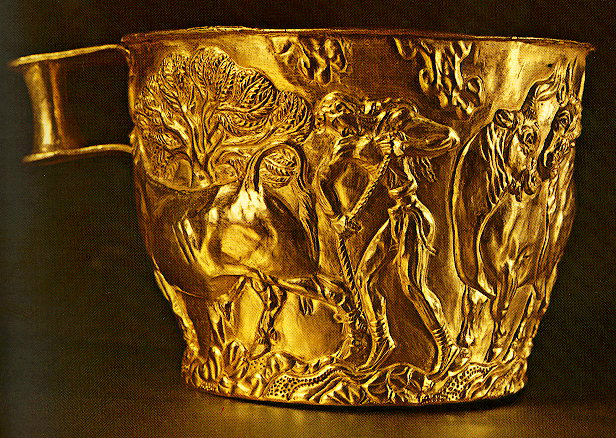 Gold cup found in Royal Tomb V, Grave Circle A.
Stirrup Jar dated around 1150 to 1100 BC found in the Granary. 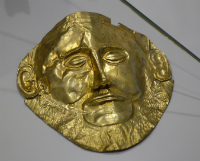 Even though the archaeological evidence says that the famous golden mask of Agamemnon did not actually belonged to the famous king, it is one of the most famous findings of the ancient world. 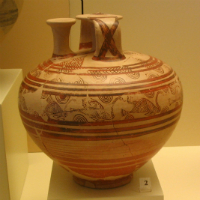 It is on display in the National Archaeological Museum of Athens, along with several other objects from the excavations in Mycenae. I visited Mycenae in late September and unfortunately arrived around 11.30am to find at least 15 tour coaches in the car park, so there were lots of people there making it difficult to walk some of the paths with ease. It would probably be better to arrive early morning or mid afternoon as it takes a good 2 hours to walk around. 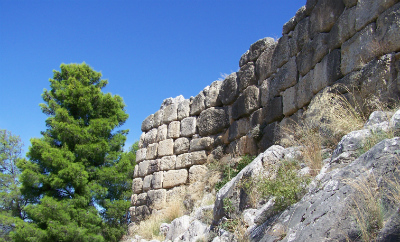 I was staying in Nafplio and visited Tiryns on my way to Mycenae which is why I arrived late. You need good walking shoes as some of the paths are quite difficult and the climb to the top is not easy. You also need a hat and a couple of bottles of water. The museum (included in the price of the ticket) is absolutely wonderful. 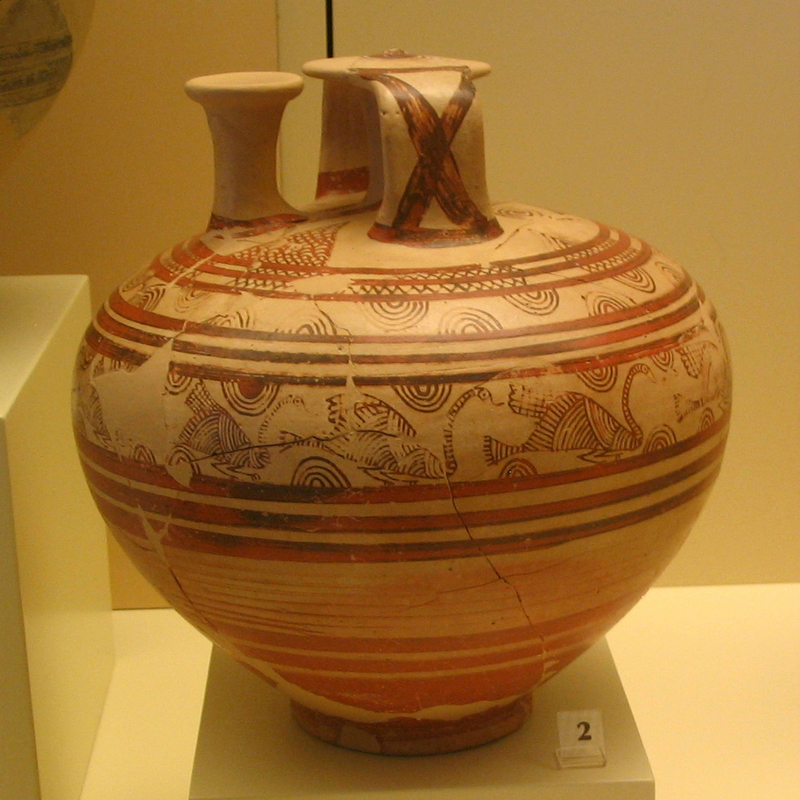 Some of the items on display are copies of the originals which are in the National Archaeological Museum in Athens. The ruins of the palace are a little disappointing but the Lion Gate, the Tholos Tombs, the Grave Circles and the rest of the site certainly make up for that.